This type of cable railing is made with the body of the rail as stainless steel. We offer several “body” options such as 2×2 square tubing or 1 1/2″ pipe and many other combinations. The finishes for our stainless steel railings vary from 60 Grit satin to polished. Our standard finish is 180 grit. We will help you with the finish option as needed. This type of cable railing is made with the body of the rail as Aluminum. We offer several styles such as 2×2 square tubing or 1 1/2″ pipe. The finishes for our aluminum railings is powder coated, primed and painted, or Kynar coated. We recommend powder coated for salt air environments. 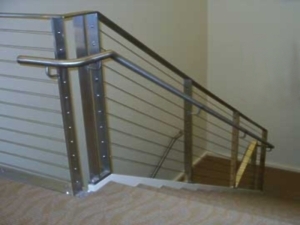 This type of cable railing is made with the body of the rail as Iron. We offer several styles such as 2×2 square tubing or 1 1/2″ pipe and many other combinations. The finishes for our iron railings is powder coated or primed and painted. 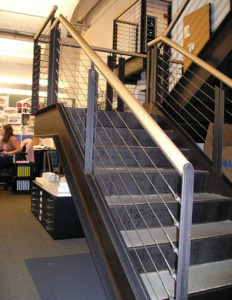 We offer the iron for interior stair railings. We provide a metallic silver finish that replicate stainless steel so you may acquire the look of stainless steel but not incur the cost. To get a quote please fill out our quote request form. 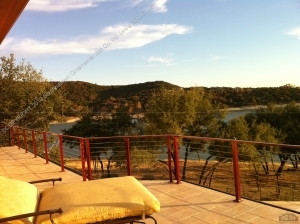 Once we have contracted the cable railing project, we provide a detailed drawing for your approval. We will work with you to ensure that we receive all of the measurements required in order to fabricate your products. Once we get a signed approval, your product goes into the fabrication process. When ready to ship, we will let you know the eta of your product and provide all information you will need prior to delivery. We install cable railing local as well as ship world wide. We also pre-fit and ship the stainless steel cable and components so that our customers may apply the cable themselves.